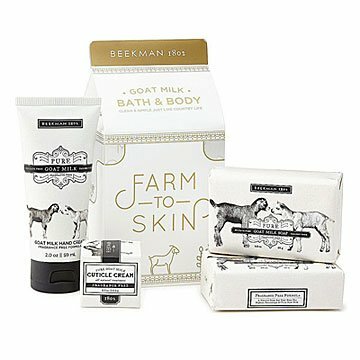 This kit was inspired by country life where soap has a big job: cleaning farmers after long days outside. Three hours north of New York City, there's a quiet farm where 130 dairy goats are milked and sent off to play in the sprawling green fields. That's where this luxurious set is made. As you lather up with the soaps, hand lotion, and cuticle cream, your mind might wander there—ours did, and ooh it's heavenly. The kit was inspired by country life where simplicity rules and soap has a big job to do: cleaning farmers after long days outside. Of course, it's also great for city folk, and has a lavish feel like something you'd find in a day spa. The products are all-natural, and fragrance- and chemical-free, which makes them a great gift for anyone in your life who enjoys that squeaky clean feeling. Made in Sharon Springs, New York.